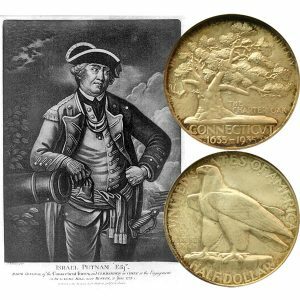 Today, the Connecticut Tercentenary Commemorative Silver Half Dollar Coin remembers when General Putnam, outnumbered ten to one, escaped the British on March 26, 1779 then returned with more troops to fight. A few miles northeast from Ridgefield is the village of Reading, distinguished as being the headquarters of General Putnam in the winter of 1779. He occupied that position with General Poor’s brigade of New Hampshire, two Connecticut brigades, Hazen’s infantry corps, and a corps of cavalry under Shelden, for the purpose of covering the country from the British lines in New York, eastward along the Sound. Like many of the New England villages, it is scattered, and beautifully shaded with elms, maples, and sycamores. Putnam’s quarters were at a house situated on the Norwalk and Danbury Road, about three miles westward of the Congregational Church in Reading. During the winter a mutinous spirit pervaded the Connecticut troops. They were badly fed and clothed, and worse paid, for their small pittance, when received, consisted of the rapidly-depreciating Continental bills. Brooding over their hard lot, the Connecticut brigades finally resolved to march to Hartford and demand of the Assembly a redress of grievances. The second brigade had assembled under arms for that purpose, when in formation of the movement reached Putnam. If this speech did not display the polished eloquence of Demosthenes, who made the Athenians cry out with one voice, “Let us go and fight Philip,” it possessed the same spirit and produced a similar result. When Putnam concluded his short address, a loud cheer burst from the discontented regiments, and they returned to their quarters in good humor, resolved to suffer and fight still longer in the cause of liberty. It was during Putnam’s encampment at Reading, in 1779, that the famous event occurred at West Greenwich, or Horseneck, in which the general was the principal actor. He was visiting his outposts at West Greenwich, and tarrying at the house of the late General Ebenezer Mead. Early on the morning of the 26th of March, while standing before a looking-glass, shaving, he saw the reflection of a body of “red-coats” marching up the road from the westward. He dropped his razor, buckled on his sword, and, half shaven, mounted his horse and hastened to prepare his handful of men to oppose the approaching enemy. They were a body of nearly fifteen hundred British regulars and Hessians, under Governor Tryon, who had marched from their lines in West Chester county, near King’s Bridge, the previous evening, with the intention of surprising the troops and destroying the salt-works at Horseneck Landing. A scout of thirty men, under Captain Watson, who had been sent out by Putnam, discovered the enemy in the night at New Rochelle. At daylight they had advanced to Rye Neck, and there a slight skirmish ensued between the British advanced guards and Putnam’s scouts. The latter retreated to Sawpits, on the Byram River, and thence to Horseneck, pursued by the enemy. Putnam arranged his men (only one hundred and fifty in number) upon the brow of the hill, by the Congregational Church in the village. There he planted a battery composed of two old iron field pieces, and awaited the approach of the enemy. They moved up the road in solid column until almost within musket-shot, when detachments broke off and attempted to gain Putnam’s flanks. At the same moment the British dragoons and some infantry prepared to charge. Perceiving this, and discovering the overwhelming numbers of the enemy, Putnam ordered a retreat, after a few discharges of the field pieces and some volleys of musketry. So near was the enemy, that the retreat of the Americans became a rout. The soldiers broke and fled singly to the adjacent swamps, while the general, putting spurs to his horse, sped toward Stamford, pursued by several of the dragoons. A quarter of a mile eastward of the Congregational Church is a steep declivity, on the brow of which the road turned northward, and passed, in a broad sweep, around the hill. Putnam perceived that his pursuers were gaining upon him, and, with the daring of desperation, left the road and wheeled his horse, while on a gallop, down the rocky height, making a zigzag course to the bottom, and reaching the road again in safety. The dragoons dared not follow, and, discharging their pistols at Putnam, without effect, rode back to the main army, and the general reached Stamford, five miles eastward, in safety. Tryon plundered the inhabitants of everything valuable, and, having destroyed a few saltworks, a small sloop and store, and damaged the houses of the Whigs, retreated to Rye the same evening, and the next day reached King’s Bridge. As soon as Putnam arrived at Stamford, he collected some militia and a few of his fugitives, and returned to attack the enemy on his retreat. He succeeded in taking thirty-eight prisoners and in recapturing a portion of the plunder, which he restored to the inhabitants. There were about twenty Americans killed. The loss of the British in killed is not recorded. The Connecticut Tercentenary Commemorative Silver Half Dollar Coin shows with an artist’s image of General Israel Putnam, circa 1775.